Which is better golf GPS or laser? Home » Equipment » Which is better golf GPS or laser? What are your favorite golf aids? This golf app allows you to download courses for free from its web site, or create your own. I have created about 20 myself. The nice thing about this app is that it not only shows you distance to front/middle/back of the green it also gives you the distance to a hazard. When you create your own course using “Course Maker”, it uses Google maps. You zoom in on the course of choice. Next you zoom in on the green of hole number 1 and click on “Add Hole 1”, Then it drops 4 flags. You then position front, middle and back flags (red, white, and blue respectively), then you get to position a “hazard” flag. I have had this app since it was only in a windows version. Then when I got my androids all of the courses ported over. Great job Gudy at GudenSoft! I know there are other apps out there, but I have to give a big thanks to Gudy at GudenSoft. 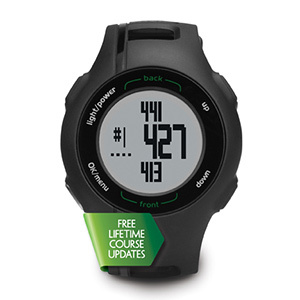 For a “Christmas in July” present, I received a Garmin S1 golf watch. Awesome, simply awesome! I never have to pull out my phone, unlock it, wait for it to get a GPS sync. (although my Galaxy S4 Syncs VERY quickly). I simply look at my wrist and there it is. I never have to tell it what hole I’m on. One reason I find GPS better than laser is that when you have a blind shot, you can tell the distance. For example. I was on a dogleg and there were trees between me and the hole. The golf watch told me I had 140 to the middle of the green. For me this meant 9 iron. I knew with a 9 iron I would easily clear the trees. I stuck it to 10 feet from the hole and made the putt. With a laser I could not have gotten an accurate distance without line of site. My golf partner has a laser and I often find it more accurate than the GPS, but in times of not being able to see the pin (behind trees, over a hill, etc.) it is useless. If I had to pick one, I would recommend a GPS, but what I really want is a Golf Watch with GPS and laser. This would be the ultimate. My next (golf) fantasy would be to use the new Google Glass with an app that analyzed the green and showed you the line. This would be awesome. I used to use a golf gps for my yardage but lately i find myself relying more on my bushnell rangefinder. I know it takes a little longer to obtain the yardage but I like the fact that I can pretty much shoot anything and get a very accurate yardage reading. Unlike a GPS where you are limited to way points and green/pin yardage, I can shoot any tree or object and get the correct yardage. 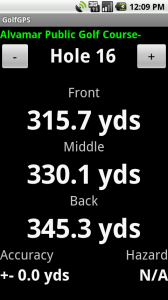 Also, i find the distances from a rangefinder much more accurrate.